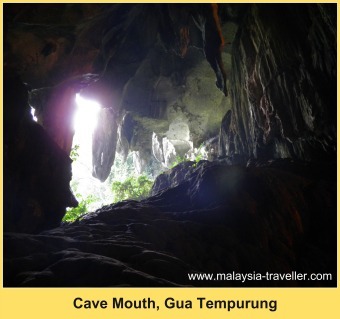 Gua Tempurung, located 25km south of Ipoh near Gopeng, is probably the largest cave in Peninsula Malaysia and has plenty to attract the serious caving enthusiast, the adventure seeker or just the casual visitor. A lot of work went into creating this massive cave. First of all this entire area, known as the Kinta Valley, needed to be covered by sea. Billions of microscopic marine organisms had to die and fall to the ocean floor where their tiny shells were compressed into limestone. Then the ocean floor had to be uplifted from under the sea by massive movements of the earth's crust. Finally rainfall and flowing water had to work its magic for the next 250 million years or so, carving sinkholes, chimneys and galleries from the limestone rock. Meanwhile millions of specs of calcium carbonate contained in drops of dissolved limestone coagulated together at an infinitesimally slow rate to create the wonders of stalagmites and stalactites. That's why we humans have to look after our caves. If we break off a piece of stalactite it won't grow back in our lifetime (they grow at the rate of 1 inch every 200 years on average). Apart from limestone, the cave contains deposits of tin, marble and other minerals. There was some small-scale tin mining in the cave at various times over the past century. 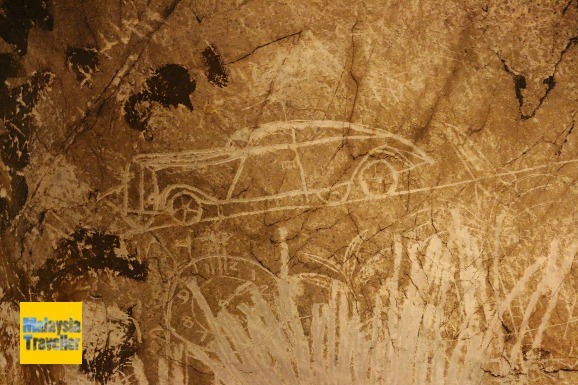 During the Malayan Emergency (1948-1960), communist guerrillas used the cave as a hideout and some of their graffiti is still visible on the walls. 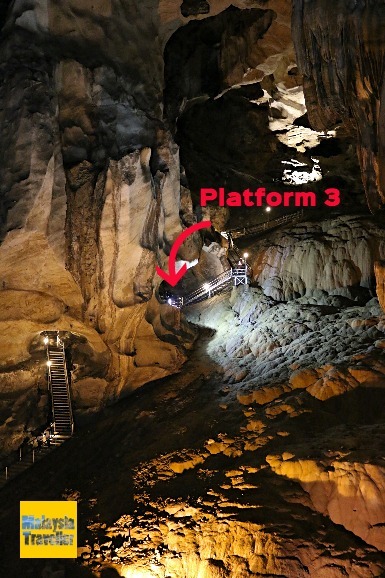 In 1995 work began to turn the cave into a tourist attraction and steel and concrete staircases were put in place, viewing platforms and railings added for safety and spot lights placed at strategic locations to illuminate the cave's most attractive features. Historical graffiti from the Emergency era (1950's). This drawing of a car could have been used by the Communists to plot an ambush similar to the one which killed Sir Henry Gurney, the High Commissioner of Malaya. 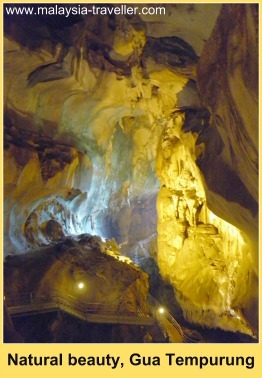 The total length of the cave is 4.5km although the part accessible to the public is about 1.9km. The cave contains an underground river of 1.6km in length. - Golden Flowstone Cavern Reaching 90 meters in height, this gallery includes a smoothed stone cascade which looks golden when the river is in flow. 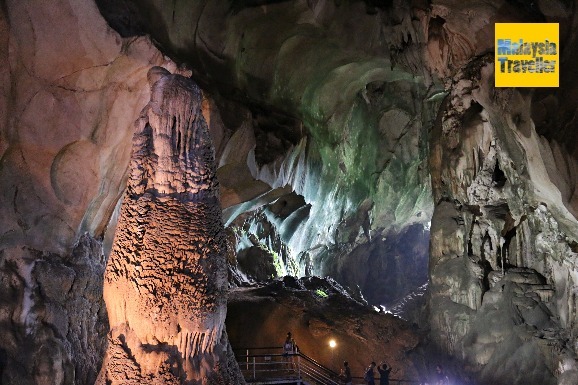 - Gergasi (Giant) Cavern Contains a massive 15m high column. - Tin Mine Cavern Excavations left by earlier tin miners can be seen here. - Alam (Universe) Cavern A 72 meter high cavern. - Battlefield Cavern Fallen stalactites and rock formations litter the floor of this gallery including one nicknamed the Fallen Warrior. Some of these domes are said to resemble coconut shells.Tempurung is the Bahasa word for coconut shell. 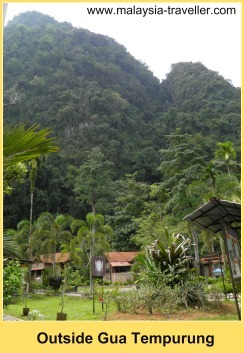 The karst hill above the cave is sometimes called Gunung Tempurung and is about 500m high. Its spectacular size and shape make it clearly visible from the North South Expressway. The cave is home to bats especially during the mating season from March to May. Their droppings have created bat guano artworks on some the dome ceilings. Entrance fees are correct as at 1 January 2018. Duration: 40 minutes (though we completed it in less time). Cost: Adult RM 20, Child RM 10 (age 6 -12), Seniors RM 10 (age 60+). This is a dry walk along concrete pathways and steel staircases as far as the Golden Flowstone cavern (as far as Platform 3). Plenty of viewing galleries to admire the amazing rock formations. Rated as Easy. No guide required. Duration: 1 hr 45 mins. This is also a dry walk but continues to cover all 5 domes (up to Platform 5). More strenuous with many more steps to climb. Rated as Slightly Strenuous. No guide required. Duration: 2 hrs 30 mins. Participants will get wet as part of the return journey involves wading in the underground river. Rated as Exciting and Challenging. This is a ranger-guided tour. Duration: 3 hrs 30 mins. Timings: From 9am. Last tour starts 11am. This tour covers all 5 caverns and the eastern side of the cave facing the North-South Expressway. The return journey is by underground river. Rated as Challenging and Strenuous. This is a ranger-guided tour. The Wet River Adventure Tours (Tours 3 & 4) are subject to weather conditions. Tour 1 goes as far as Platform 3. 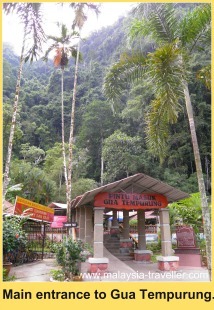 The first time I visited Gua Tempurung it was Monday morning and I was the only visitor there. As a result I was only allowed to do Tour #1 which is a pity as I would have liked to see more. Still, it was very interesting and the photos shown here were taken on that tour. For the dry tours (1 & 2), wear a T-shirt and long trousers or shorts. It is quite hot and sticky in the cave. Wear comfortable hiking boots, shoes or sandals with a good grip. Bring a camera capable of taking reasonable shots in low light conditions. A torch or headlamp would be useful but your guide will have one. For the wet tours (3 & 4) you will need a change of clothing and a towel after you complete the tour. Knee pads and gloves are recommended. You will need to waterproof your camera if you bring one. You will be provided with a helmet. 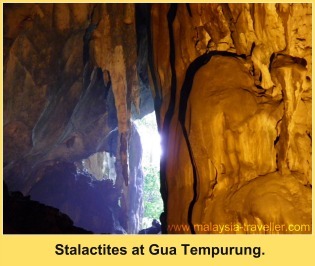 The location of Gua Tempurung is marked on my interactive map on the Caves page. It was easy to find. I exited the North-South Expressway at the Gopeng exit. After the toll gate I turned left onto Federal Route 1 in the direction of Kampar. After 5km I turned left when I saw the large billboard pointing to Gua Tempurung. It was another couple of kilometres from there. There was plenty of parking. 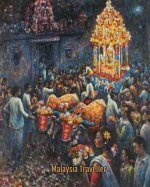 While you are in Ipoh you could take my walking tour. There was a shop selling snacks, water and souvenirs. They were also renting bicycles at RM6 per hour (RM3 for kids). Toilets and changing rooms are available. It is possible to do white water rafting on the nearby Kampar River. There are a few adventure tour companies offering packages of shooting rapids and paddling along the Sungai Kampar. Take a look at Oxbold Extreme Sport's website to see a typical package (I have not tried it). 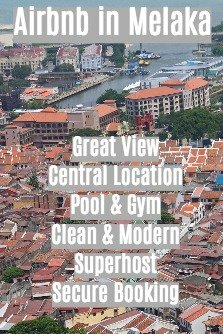 Nearby Ipoh offers a wide choice of accommodation. Take a look at Agoda's website for a full list of hotels in Ipoh and elsewhere in Perak at discounted rates.